The Slinky toy is a coil of wire or plastic that has the ability to "walk" on its own, usually down a flight of stairs. Toys of infinite varieties have amused children, and some adults, of every civilization. Before the advent of the toy industry, playthings were made at home or by accomplished crafters. The industry grew from the area around Nuremburg, Germany, beginning in the Middle Ages. Toys were finely crafted of gold, silver, brass, iron, tin, wood, silk, and leather. With the Industrial Revolution came new machinery and production methods. Wood-pulp paper, aniline dyes, and chromolithography were used to mass produce storybooks, card and board games, and paper dolls. Advanced metal-metalworking techniques were exhibited in the plethora of steel-plated toys such as trains, boats, and animals. By the late nineteenth century, three major toy companies in the United States, Milton Bradley, Selchow & Righter, and Parker Brothers, had been established. The intrusion of World War I and II severely curtailed European trade, and contributed to the rise of the toy industry in the United States. During the latter period of that era the Slinky toy was invented, quite by accident. Richard James was a marine engineer employed at the Cramp Shipyard outside Philadelphia, Pennsylvania, during World War II. One day in 1943, as James was devising a spring that would hold shipboard marine torsion meters steady, one of the springs fell off his desk, springing end over end across the floor. Impressed and intrigued by the simplicity of it, James went home and told his wife he had a great idea for a new toy. He refined the coil of steel until he was satisfied with the end-over-end movement. The finished prototype was a 2.5 in (6.35 cm) stack of 98 coils. Betty James pored over the dictionary to find an appropriate name for the gadget, eventually deciding on the word slinky. Two years later, the Jameses borrowed $500 to manufacture a small inventory of slinky toys. Their initial attempts to sell the springy toy through small retail outlets were unsuccessful, and it seemed that they would have to abandon the project. Then, at the height of the Christmas holiday season, Gimbels department store agreed to sell 400 of the slinky toys. Richard James appeared in the store's toy department one night to demonstrate the toy and within an hour and a half, the entire inventory was sold out. By the following year, Richard James had quit his job at the shipyard and the couple opened a factory to mass produce the slinky toys. At the 1946 American Toy Fair, slinky toys were a popular item. In the 1950s, business soared and the Jameses were monetarily quite successful. Richard James also became somewhat of an eccentric, joining a religious cult and tithing much of his money to it. In 1960, he left his wife Betty, their six children, and a very successful business to live in Bolivia. metal Slinky was made from 80 ft (24.4 m) of wire. At the end of the twentieth century, the company was making two sizes in steel and two in plastic of various colors. Consumers have found ingenious uses for slinky toys, employing them in pecan-picking machines and using them as drapery holders, antennas, light fixtures, window decorations, gutter protectors, pigeon repellers, birdhouse protectors, therapeutic devices, wave motion coils, table decorations, and mail holders. For physics teachers and students, it is the tool of choice to demonstrate the properties of wave motion. The Slinky is on display at the Smithsonian Institute in Washington, DC, and in the Metropolitan Museum of Art in New York, New York. Fine spring steel wire, 0.0575 in (0.146 cm) in diameter, is purchased from an outside source. It is composed of high carbon steel and coated for durability. The plastic is also purchased from a supplier and then forced through an extruder to form long thin strands. Some of the slinky toys have animal heads and tails attached to either end. The animal parts are created from molds by an outside supplier. 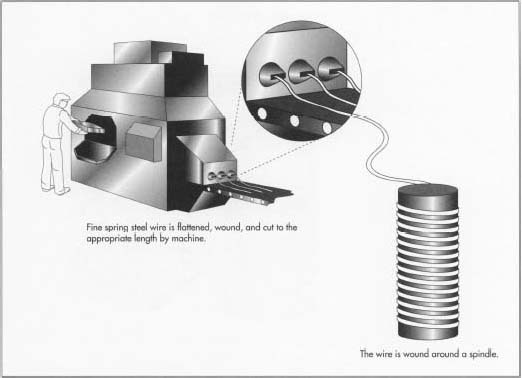 1 The wire is fed into the machinery by a factory worker. The machine flattens the wire and winds it on its end. While it is being wound, the machine automatically cuts it to the preset length. The nature of spring wire is such that once it has been wound, it never loses that shape. crimps one end to the coil next to it. The worker then turns the wire around and crimps the other end in the same fashion. 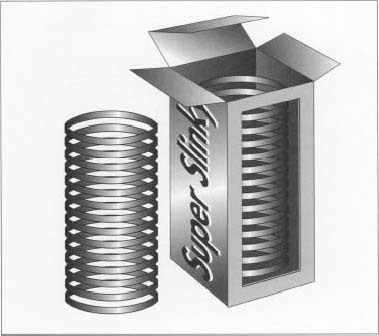 If the slinky toy is to have animal attachments, it is placed on an additional conveyer belt, traveling to a work station where the heads and tails are applied manually. 3 When the plastic emerges from the extruder, it resembles a piece of warm taffy. It is then mechanically wrapped and cast around a mounted spindle called a mandrel. As the plastic hardens, it takes on the curled shape of the mandrel. The coiled plastic is dipped into a warm water bath to further seal it into its curled shape. 4 The slinky toy is sent on a conveyer belt to a worker who inserts the toy into a box that has been opened by an automatic boxing machine. The boxed slinky toy moves back into the boxing machine, which then closes the box. 5 Further along on the conveyer belt, the box enters a shrink-wrap machine, which encases the box in plastic wrap. The boxes are then loaded into display or shipping cases. It would seem that in an age of electronic gadgetry, the slinky toy would fade into obscurity, however it has enjoyed consistent success over the years primarily because of its simplicity. Although the package includes instructions on how to use the toy, something that has inspired various spoofs on the Internet, anyone who picks one up knows what to do with it. The appearance of slinky toys in the 1990s movies "Toy Story" and "Ace Ventura, Pet Detective" has only served to increase demand. In a 1993 Philadelphia Inquirer Magazine article, reprinted in the November 1993 issue of Reader's Digest, writer Jeanne Marie Laskas summed it up this way: "You don't have to be smart, athletic, rich or clever to appreciate the Slinky. It's a toy for regular people." Laskas, Jeanne Marie. "The Lady Behind the Slinky." Reader's Digest, November 1993, p. 77. Witchel, Alex. "Persevering for Family and Slinky." The New York Times, February 21, 1994, pp.Cl, C7. Robinson, Kelly and Sherry Miller. Slinky Homepage. http://www.messiah.edu/hpages/facstaff/barrett/slinky/home.htm (July 9, 1997). "The Slinky Story." James Industries. Hollidaysburg, Pennsylvania. Great summary of the story of the Slinky. Everything is accurate except for the statement that Richard James joined a cult in Bolivia. This is not accurate information. Richard James went to Bolivia with Wycliffe Bible Translators which is a reputable Christian organization. He also did not "abandon" or "leave" his wife and children to become a missionary. He begged and pleaded his wife to come with him to do missionary work in Bolivia. She would have none of it. I know this for a fact because I have read the letters that Richard James, my father, wrote to Betty James. He also tried to keep in touch with the children and wrote to his oldest son regularly. Apparently, Tom never received nor read those letters because his mother interceded and destroyed the letters before Tom could read them. I write this information because I am really tired of reading about how my father "left" his wife and children to join a "cult." To me, that is defamation of character. That is Betty's side of the story but it is just her side of the story. My father never lived long enough to defend his own name. Yes, I admit he was a bit on the eccentric side but he was a man of high moral character. He was a good man. And for your information, my father did not ask to divorce from Betty James. Betty James filed for divorce and he merely signed the papers after it was clear that she would not agree to join him in Bolivia. I really enjoyed reading the history of the slinky, and the family behind it. I think it was extemely touching and informative, especially the part added by Sarah James! With the way things get twisted, or don't seem to accurately describe situtaions, it's nice to hear the other side of the story. I'm sorry for the way things turned out, especially for the children! I hope all is well anyways, although I'm sure things will never be the same!! God bless you all! !